Jockey Francisco Ramirez, Jr. rides Red Corona Warrior to an easy win in the $15,000 Texas Twister at Sam Houston Race Park on Saturday. HOUSTON, TX�APRIL 30, 2016�The $15,000 Texas Twister, at 110 yards, returned for its eighth renewal at Sam Houston Race Park. 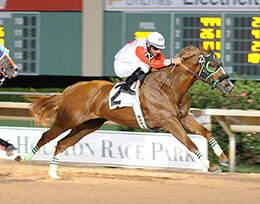 The winner of this year�s exciting �super sprint� was Red Corona Warrior, surging to the wire in :6.786 seconds. Owned and bred by the Terrazas Family, the 4-year-old son of CORONAS FAST DASH is trained by Josue Ponce, who was celebrating his 21st birthday today. "I�m pretty excited," said Ponce. "I brought two horses here this weekend and got two wins. It was a really good birthday present. I�m pleased with his effort in the stakes." "He�s a classy horse," said the winning rider. "I just tried to stay out of his way. He did it all by himself." Red Corona Warrior, sent off at odds of 11-1 returned $24.60 to his supporters. My Glory Dash with �Jimmy� Guynes in the irons, ran second and Fly Lil Curl was third. Kid Can Dash, Ipolito, Last Man Standin, Surviving Legend, Shezarealfast and Mighty Zapata completed the field. Snipes And Bites was an early scratch.